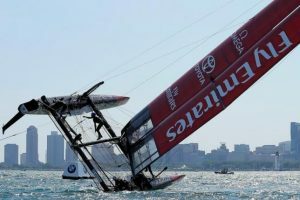 Emirates Team New Zealand and Oracle Team USA both capsized during practice races at the America’s Cup World Series in Chicago on Friday. Team New Zealand, which leads the standings, went down first in a spill on Lake Michigan that saw some crew members to fall overboard. All were recovered safely and the Kiwis recovered to start the next race 15 minutes later. “These boats are pretty hard to sail and every now and then you get them wrong,” said Team New Zealand Helmsman Peter Burling. “It was our own doing but this is what practice days are for. Team USA then tipped over after trying to avoid Artemis Racing and pinning the wing sail on the wrong side of the boat. They also resumed racing without issue. The competition will begin on Saturday. The 2017 America’s Cup will be held in Bermuda.